Baltimore Orioles pitcher Chris Tillman prepares himself during a home game against the Boston Redsox on Sept. 29, 2013 in Baltimore, Md. Fans cheer at the conclusion of Game Two of the American League Division Series against the Detroit Tigers at Oriole Park at Camden Yards on October 3, 2014 in Baltimore, Maryland. David Lough of the Baltimore Orioles sits in the dugout before a game against the Tampa Bay Rays at Oriole Park at Camden Yards in Baltimore, Md. on April 14, 2014. Richard Troxell of Thurmont, Md. prepares to sing the national anthem while an American flag is dropped behind him prior to the start of opening day at Oriole Park at Camden Yards on March 31, 2014. 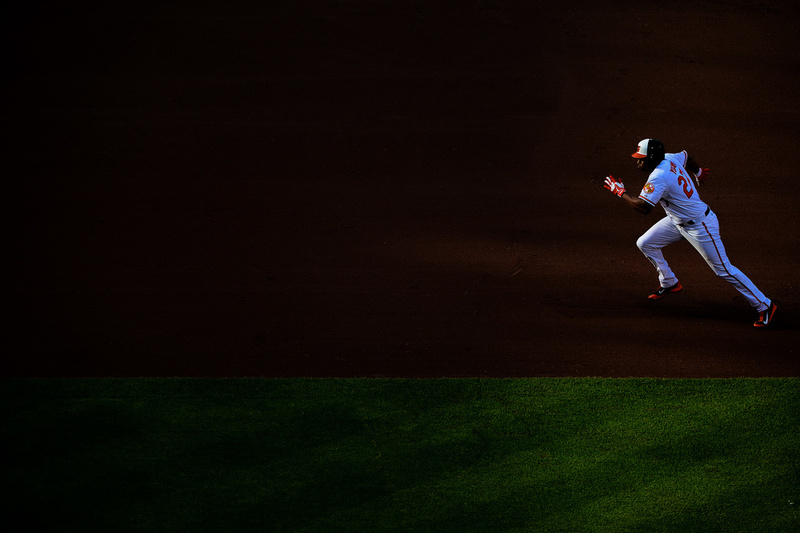 Baltimore Orioles' Delmon Young runs toward third base during a home game against the Pittsburgh Pirates at Oriole Park at Camden Yards in Baltimore, Maryland on May 1, 2014. Baltimore Orioles left fielder Steve Pearce attempts to dive for a ball during their last home game of the 2013 season on Sept. 29, 2013 in Baltimore, Md. Boston Red Sox player Ryan Lavarnway hits a single during their final game of the regular season against the Baltimore Orioles on September 29, 2013 in Baltimore, Md. 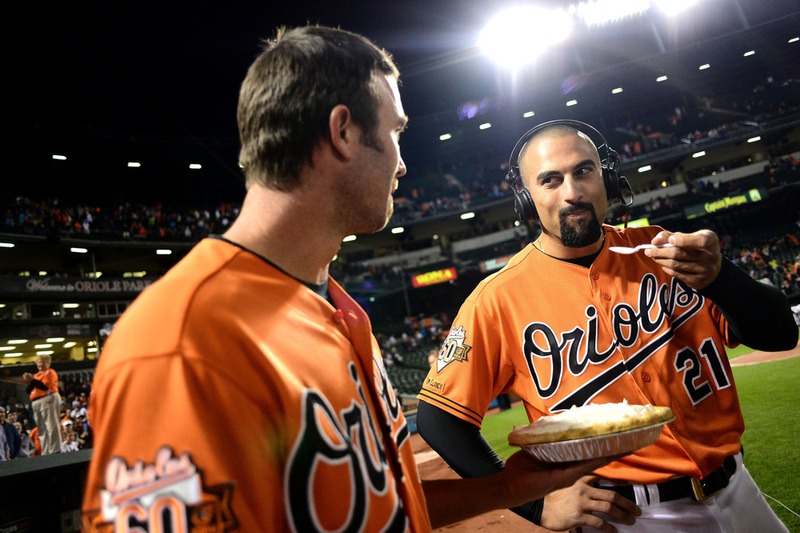 J.J. Hardy of the Baltimore Orioles, left, offers some pie to Nick Markakis of the Baltimore Orioles after a game against the Kansas City Royals on April 26, 2014 in Baltimore, Maryland. First baseman Steve Pearce of the Baltimore Orioles celebrates in the clubhouse after the Orioles defeated the Toronto Blue Jays to clinch the American League East Division at Oriole Park at Camden Yards in Baltimore, Maryland on Sept. 16, 2014. 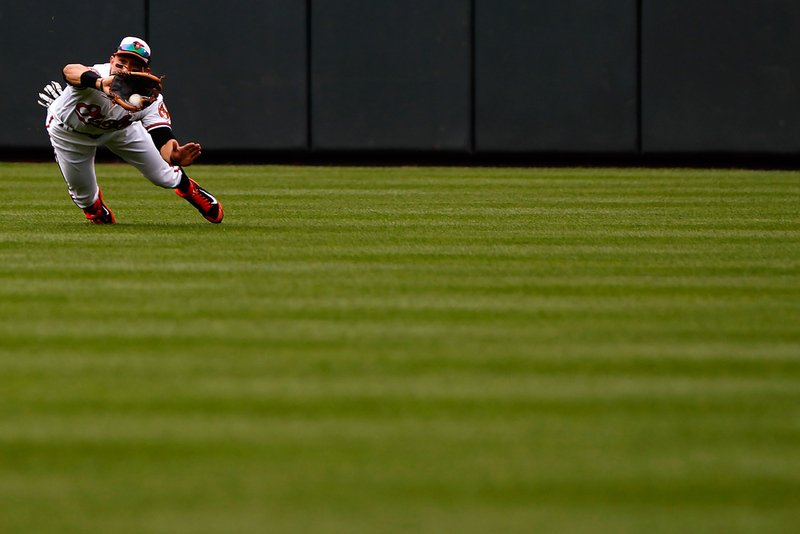 Baltimore Orioles center fielder Adam Jones reacts after missing a catch on July 27, 2013 in Baltimore, Md. Baltimore Orioles grounds crewman prepares the field for the upcoming homestand on July 16, 2013 in Baltimore, Md. Baltimore Orioles right fielder Nick Markakis prepares for an at-bat on July 31, 2013 in Baltimore, Md. Baltimore Orioles shortstop JJ Hardy prepares for an at-bat against the Houston Astros on July 31, 2013 in Baltimore, Md. Members of the Baltimore Orioles grounds crew run onto the field during a rain delay to remove the tarp at Oriole Park at Camden Yards in Baltimore, Maryland on June 10, 2014. Baltimore Orioles catcher Matt Wieters walks off the field during game against the Washington Nationals at National Park on June 29, 2013 in Washington, D.C.
Nate Mclouth, Baltimore Orioles left fielder warms up during game against the Washington Nationals at National Park on June 29, 2013 in Washington, D.C.
Catcher Caleb Joseph, right, of the Baltimore Orioles slides safely into home past catcher Brian McCann of the New York Yankees during a MLB game at Oriole Park at Camden Yards on April 12, 2015 in Baltimore, Maryland. Baltimore Orioles Fans get excited during the "Fan of the Game" contest during a home game at Oriole Park at Camden Yards in Baltimore, Md. Baltimore Orioles first baseman Steve Pearce celebrates after Delmon Young hit a double during Game Two of the American League Division Series against the Detroit Tigers at Oriole Park at Camden Yards on October 3, 2014 in Baltimore, Maryland. Adam Jones of the Baltimore Orioles wears the Orioles' Mascot's hat during a home game on June 2, 2013 in Baltimore, Md. Center fielder Adam Jones of the Baltimore Orioles celebrates with fans after the Orioles defeated the Toronto Blue Jays to clinch the American League East Division at Oriole Park at Camden Yards in Baltimore, Maryland on Sept. 16, 2014. First baseman Steve Pearce of the Baltimore Orioles celebrates with fans after the Orioles defeated the Toronto Blue Jays to clinch the American League East Division at Oriole Park at Camden Yards in Baltimore, Maryland on Sept. 16, 2014. 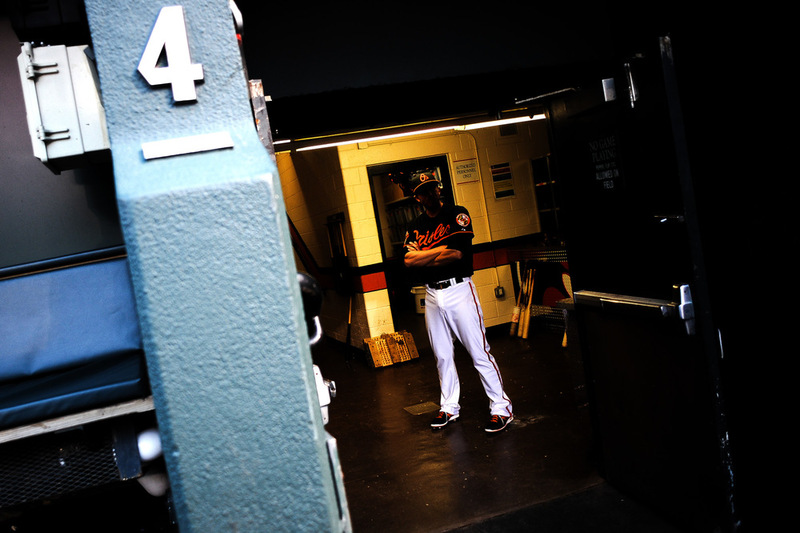 Baltimore Orioles shortstop J.J Hardy looks out the dugout entrance before a game against the Toronto Blue Jays on April 11, 2014 at Oriole Park at Camden Yards in Baltimore, Md. 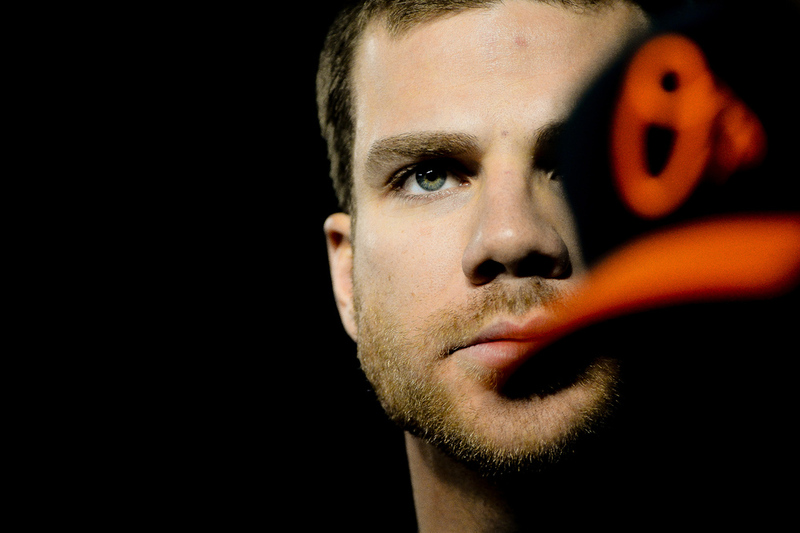 Baltimore Orioles first baseman Chris Davis stands in the dugout before preparing for an at bat in the first inning of a home game on April 25, 2014 in Baltimore, Md. 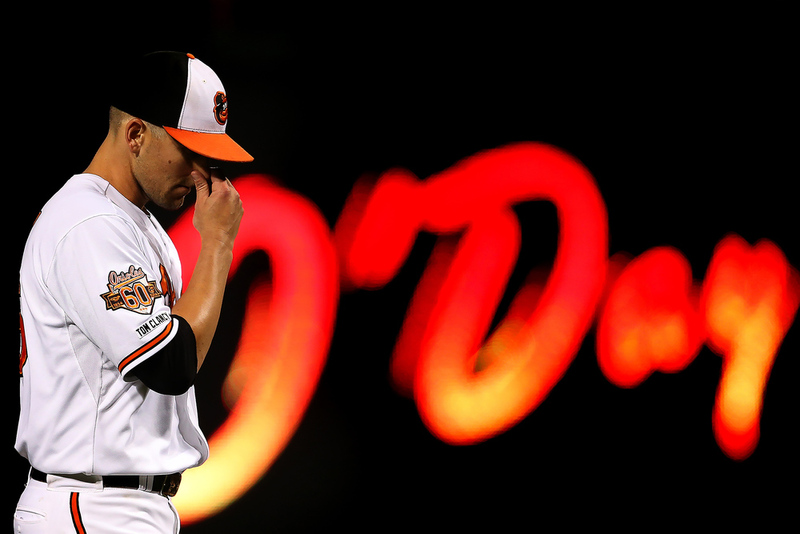 Pitcher Darren O'Day of the Baltimore Orioles walks off the field during a MLB game against the Toronto Blue Jays on Sept. 16, 2014 at Oriole Park at Camden Yards in Baltimore, Maryland. Starting pitcher Wei-Yin Chen #16 of the Baltimore Orioles delivers a pitch during a game against the Boston Red Sox at Oriole Park at Camden Yards in Baltimore, MD on June 26, 2015. Nick Markakis of the Baltimore Orioles and Baltimore Orioles pitching coach Dave Wallace look on during the first inning of a home game against the Tampa Bay Rays on June 27, 2014 at Oriole Park at Camden Yards in Baltimore, Maryland. Baltimore Orioles third base coach Bobby Dickerson waits in between innings during a home game on Sept. 28, 2013 in Baltimore, Md. 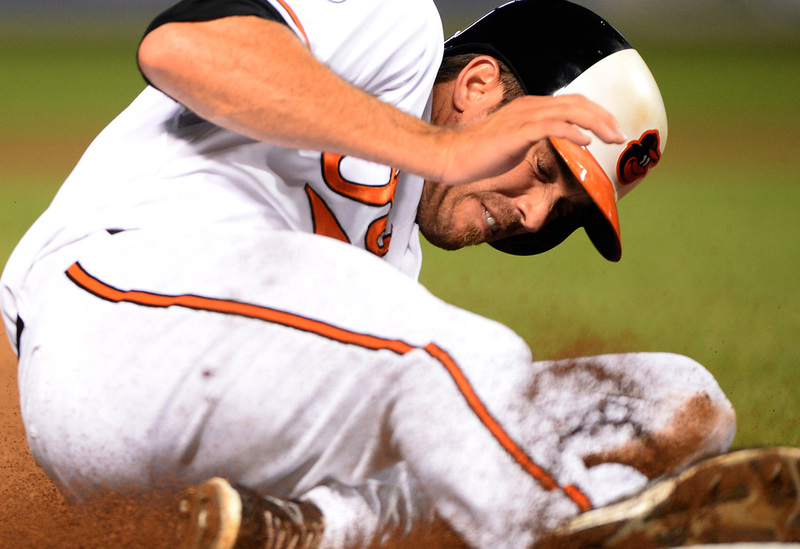 Baltimore Orioles shortstop J.J. Hardy slides into third base during a home game against the New York Yankees on Sept. 9, 2013 in Baltimore, Md. 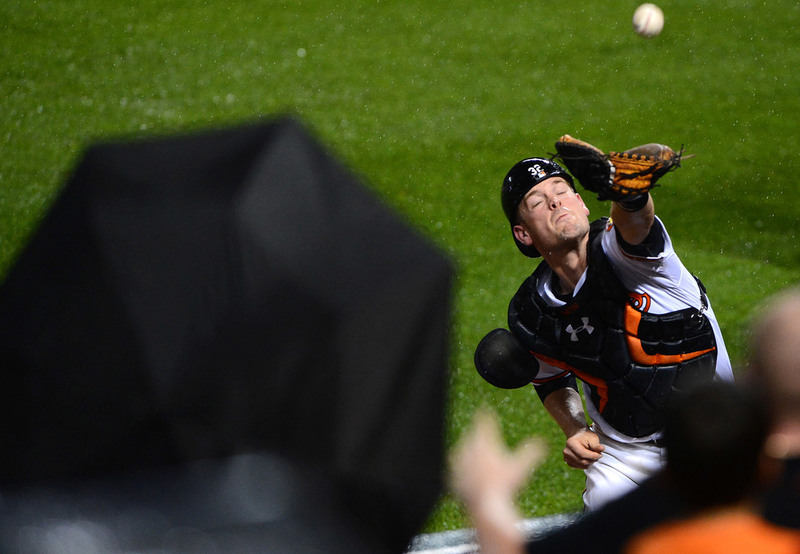 Baltimore Orioles center fielder David Lough makes the catch during a game against the Oakland Athletics on June 8, 2014 at Oriole Park at Camden Yards in Baltimore, Maryland. 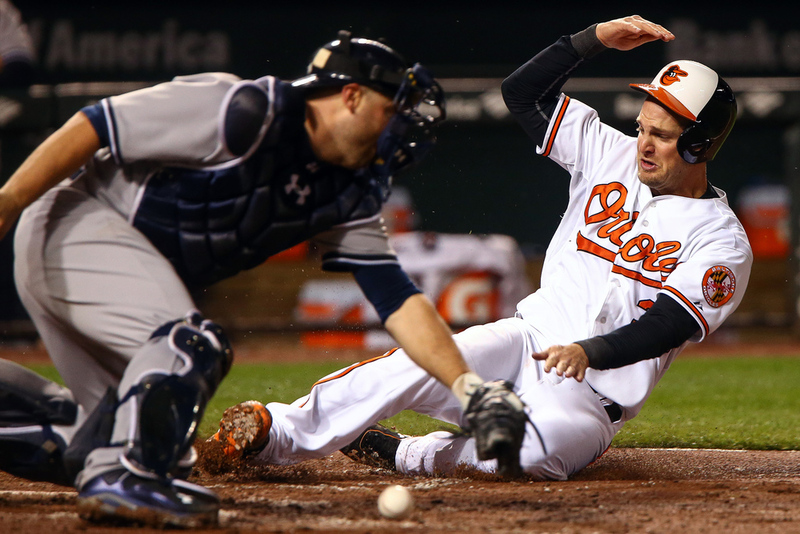 Baltimore Orioles catcher Matt Wieters dives into the stands after a foul ball on June 10, 2013 in Baltimore, Md. Paul Janish #15 of the Baltimore Orioles looks on after getting pied after defeating the New York Yankees at Orioles Park at Camden Yards on October 3, 3015 in Baltimore, Maryland. 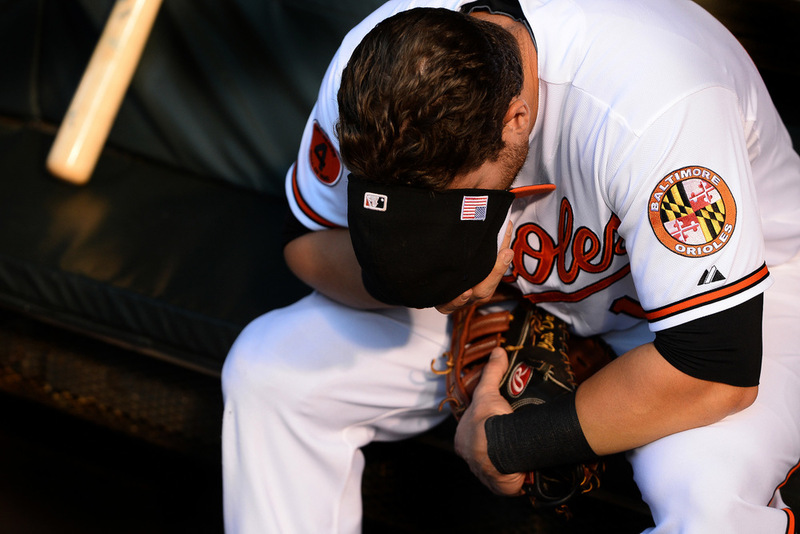 Baltimore Orioles first baseman Chris Davis removes his hat and covers his face in thought while preparing for a home game against the New York Yankees on Sept. 11, 2013 in Baltimore, Md. Davis put up 53 home runs in the 2013 season, a new franchise record.